On October 14th, millions of people mysteriously disappeared in what was labeled The Sudden Departure. There was no rhyme or reason to who was taken. No commonality can be found through religion, behavior, or age. There was seemingly no discrimination. Those who remained, the leftovers, have nothing to do but attempt to pick up the threads of their existence in any way they know how. I finished this book two days ago and I have put off writing the review until now because I couldn’t quite figure out what I should say. This book left me stunned, and not in a good way. We follow a family that miraculously stayed together after the departure. They somehow managed to escape October 14th in tact, and yet they let the departure affect them in more intense ways then the rest of the world seemed to. It was almost as if they felt compelled to make themselves as miserable as everyone else, like they didn’t deserve to stay together. All four members of the family have their own story and they each do their own thing, going their separate ways. The Dad, Kevin, becomes Mayor in an attempt at pulling people back together. The Mom, Laurie, joins the Guilty Remnant, a group of people who believe it is their job to make sure the world remembers that they were left behind because of their sinful ways. They take a vow of silence and follow everyone around that they believe are participating in sinful acts…all while smoking. (Which doesn’t make one bit of sense to me.) The son, Tom, joins a cult that is lead by a man called Holly Wayne who believes he can take peoples pain away by hugging them. Finally, the daughter, Jill, turns into a drugged up partier, completely giving up on her future. I like to say something good about every book I read, even if there’s only one thing I can think of. With this book, I’m having a hard time coming up with it. There was just no point to it. It’s depressing without any sort of message to me because the question of why they all disappeared on October 14th was never answered. Seriously, what was the point? 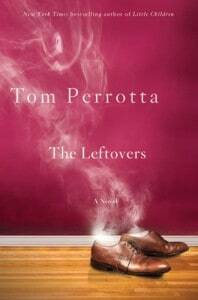 I know Tom Perrotta is a great writer, and there was nothing lacking in how he writes, it was just the content that stunk. I will probably give a different book of his a go, but I will not be recommending this to anyone. It just left me feeling funky for no apparent reason. Thanks for the frankly honest review. Might be one I check out a the local library.